Teams will be unabel to stop talking about this great team bonding program. Segway Games are unique, fun and exciting! What makes Segway Games so popular? WOW, Amazing, I want One! 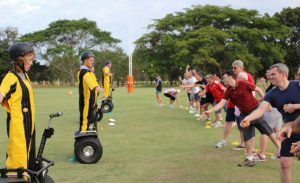 If you’re looking for team building activities that are unique, create the WOW factor and leave your group an experience they will forever remember then Segway Games certainly fits the brief. You see it takes only moments to learn but takes forever to get the smile off your face! Riding a Segway is quite simply amazing; it feels like nothing you’ve experienced – because there’s never been anything like it. It is fun and adventure wrapped up in one fantastic experience! 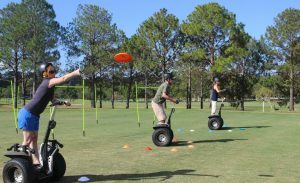 The great thing about Segway Games is that it can be enjoyed by any age group (12 years old to 90 years young) and you don’t need any special sporting skills or athletic abilities, literally anyone can play. Participants will need to demonstrate their new found skills by safely manouvering their Segway in and around a series of poles, cones and rope to complete this game. This game is truly hilarious! It’s time to get into your yellow velcro bumble bee suit so team members can throw sticky balls at you which you must catch on your suit and then ride your Segway through the slalom course, stop in the circle and then peel the balls of your suit and try and land the balls in a bucket. Participants will navigate through the slalom course with their frisbee and stop in the circle. Once in position, they will throw their frisbee where their fellow team members will use large nets in an attempt to try and catch them before the opposition catches them. As every challenge is unique and different, the team that is best able to draw upon each others strengths, create the best strategy, communicate the clearest and encourage, delegate and work together will be able to successfully complete all the games. This team building activity can literally be enjoyed by anyone. You don’t need any special skills or sporting abilities. On average we allow 2 hours to run this program but we can run it in as little as 1 hour or as long as 2.5 hours depending on your timeframes and group size. You must be at least 10 years of age. In addition to this riders must weigh at least 32 kgs and not more than 115kgs. The Segway is designed so that only 1 person at a time can ride it. Therefore you can not ride and double another person. Q: WHO IS RESPONSIBLE FOR PROVIDING THIS EVENT? Time Out Adventures is a sales, marketing and booking organisation, we do not provide or operate the Segway Games or Rides or Tours you book. Once you have made your booking you will receive a booking confirmation which will confirm who the operator is for your event. If however you would like to make changes to your booking such as the times, dates, cancel your service or have any enquiries feel free to contact us on 1300 090 767 and we gladly assist.